June 2016 release playing the Ketron Audya. His first CD for four years. 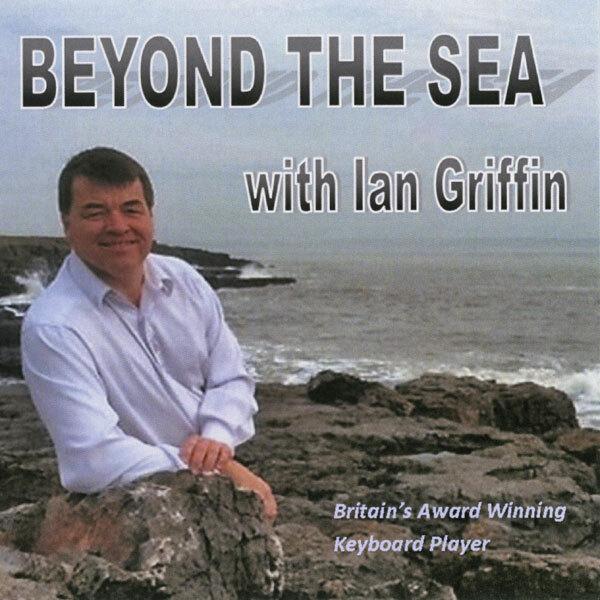 Almost 30 years on from when he made his first recording, Ian Grifﬁn presents his latest for your enjoyment. Over those years he has never been one to shy away from experimenting, owning and showcasing a number of keyboards, either as ancillary instruments to a standard organ, or in a solo capacity… sometimes using two or more in accepted organ keyboard layout, in order to use specific sounds and tone colours that the others might not have. So, in this studio recorded collection of 15 tracks you’ll thrill to a myriad of sounds from his Ketron Audya, an additional Ketron SD5 and Roland PK5 pedalboard are employed on Track 9 which is from a live concert. As both an established concert artist and cabaret accompanist he has to keep abreast of music tastes and with an eye to perhaps appealing to a younger market, BEYOND THE SEA is an eclectic mix of tunes old and new. Over the ensuing years, and boosted by working and having the pleasure of introducing him to festival audiences, my friendship with him and his family has remained ever present. So many of those ‘up & coming’ youngsters of the pioneering organ festival days have disappeared, whereas Ian Griffin has gone on to achieve so much more. This recording is but just one small part of his musical lifetime. Acknowledgements: Thanks to all who contributed to this production including Donna Eatwell (photography), Alan Ashton (sleeve notes) and Paul Evans (Final Mastering). 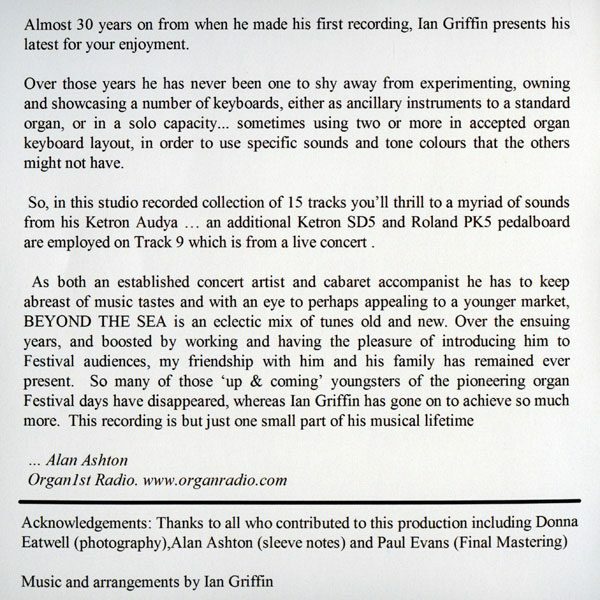 Music and arrangements by Ian Griffin. 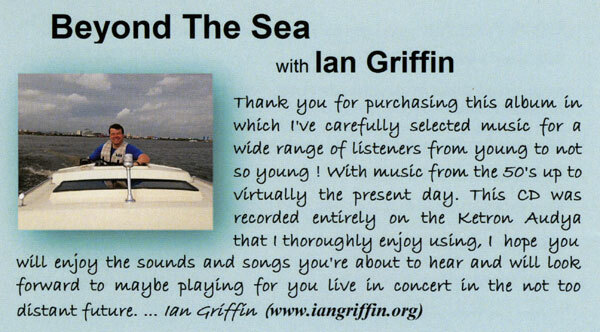 We’re continuing the Welsh theme from last issue’s reviews with the new CD from Ian Griffin. This is his first album for four years and comes almost thirty years on from his first release. The inlay states this is “an eclectic mix of old and new tunes” and all are played on the Ketron Audya. There certainly is a range of eras here too with older tracks including a lovely version of the 1959 Brook Benton hit, “Endlessly,” with piano lead, orchestral feel and a nice groove. A sax section takes the lead on “Whatever Lola Wants” which was originally written for the 1955 musical play “Damn Yankees”, here it’s joined with an accordion and octaved-piano featured “Perhaps, Perhaps, Perhaps” most famously recorded by Doris Day in 1964. “Rhythm of the Rain” was a 1960s hit for The Cascades and we even get the rain at the start (well we are in Wales). Again this is a lovely orchestra/strings arrangement with electric piano, guitar and flutes among the lead sounds. The title track, “La Mer (Beyond The Sea)” is probably the oldest song on the CD dating back to 1945 and here we have a fabulous Glenn Miller inspired swing version. Another oldie “You’ll Answer to Me” was a hit for both Patti Page and Cleo Laine in 1961, here their vocals have been swapped with a breathy sax and Rhodes piano, all wrapped up with strings and a latin rhythm. We get a little saxy with “Tears On My Pillow,” although this is not the one you’re thinking of, but the 1975 reggae song by Johnny Nash, so we get a chance to hear the reggae rhythms and sounds of the Audya which includes some great Hammond organ playing in the background as well as steel drums of course. There are modern songs too, including, “Hallelujah” the lovely 2008 X-Factor hit from Alexandra Burke (and Jeff Buckley / Leonard Cohen). This starts with electric guitar arpeggios and a beautifully played flute lead (which changes to an oboe in verse two when we get all the lovely choirs), then the whole Audya seems to be thrown at it with piano, strings and drums. I was unfamiliar with “Who I Was Born to Be” which turns out to be an original song on Susan Boyle’s debut CD back in 2009. It’s a pretty tune too with a few similarities to “Hallelujah”. Last year’s Meghan Trainor & Charlie Puth’s pop hit “Marvin Gaye” (Let’s ‘Marvin Gaye’ and Get it On) makes it’s first keyboard CD appearance here and turns out to make a good instrumental with a 1950s feel with Rockabilly style guitar, saxes, flutes and catchy ‘Doo-Wap’ style backing vocals. 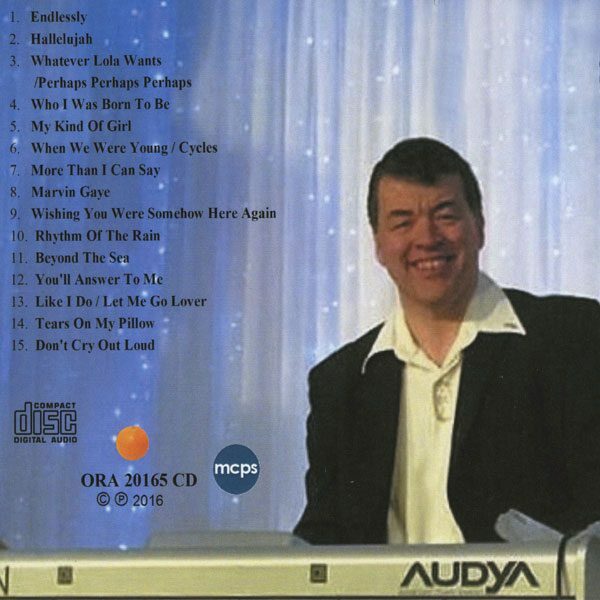 Ian’s lovely playing and arrangements make this a very enjoyable CD and there really is something for everyone, which is Ian’s aim as he wants his music to appeal to the younger audience and not just the young at heart. FULL TRACKS: Endlessly • Hallelujah • Whatever Lola Wants / Perhaps, Perhaps, Perhaps • Who I Was Born to Be • My Kind of Girl • When We Were Young / Cycles • More Than I Can Say • Marvin Gaye • Wishing You Were Somehow Here Again • Rhythm of the Rain • La Mer (Beyond the Sea) • You’ll Answer to Me • Like I Do / Let Me Go Lover • Tears On My Pillow • Don’t Cry Out Loud.